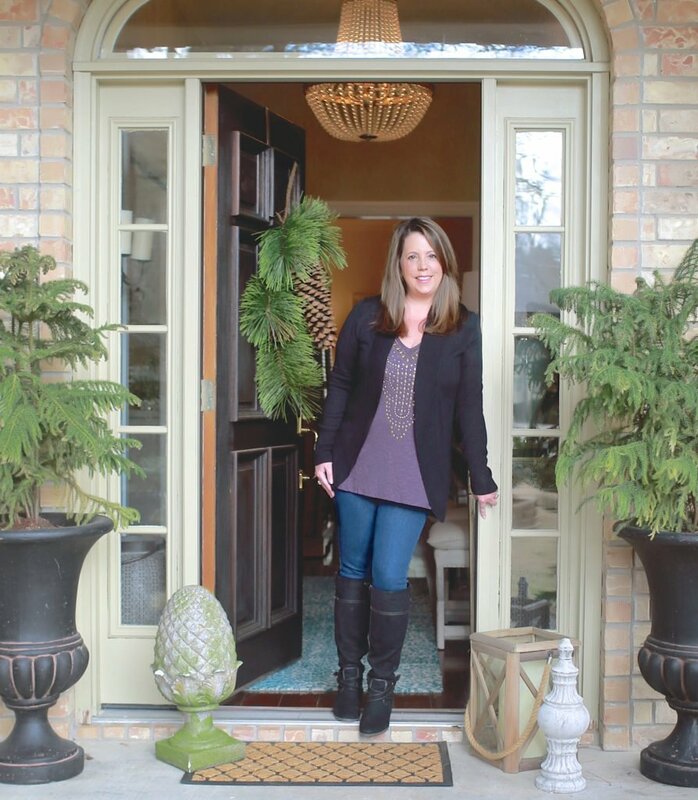 I’m so excited for today’s post because it comes from my good friend Jenny from the blog Evolution of Style. So happy to be here to talk color with you! 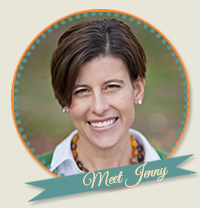 I’m Jenny, and my blog is Evolution of Style. 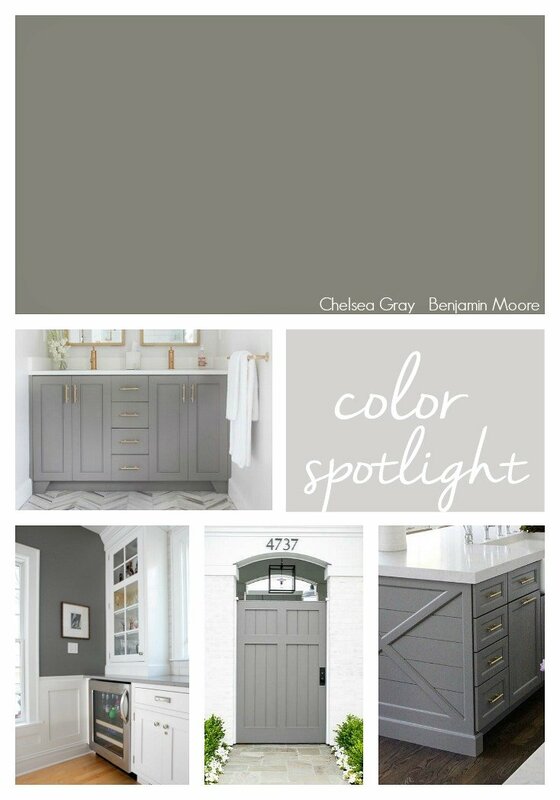 I love everything paint and paint colors, and today I’m sharing one that has been on my list of favorites for awhile now – Benjamin Moore’s Chelsea Gray. It’s such a beautiful, rich gray, and every time I see it, it catches my eye. Like in this bathroom from Driven by Decor. 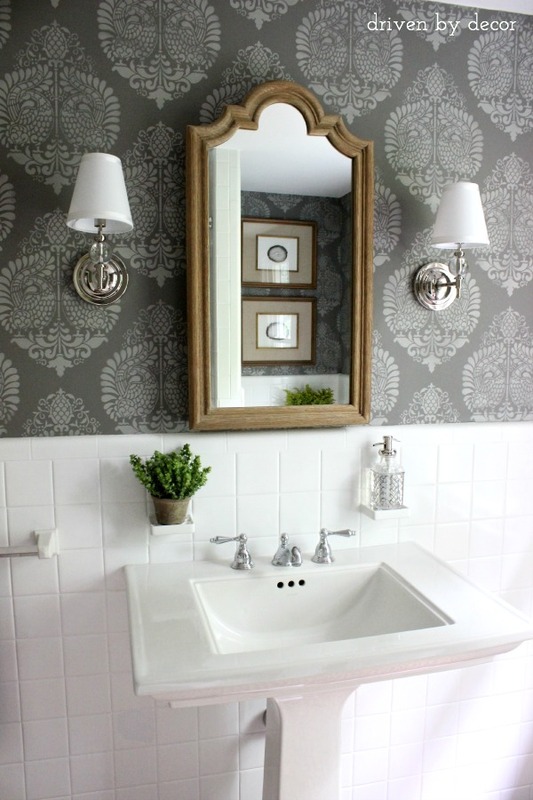 This bathroom has become one of my favorites – the two toned gray stencil – so classic and timeless. The other thing I love about this color is that it works everywhere – bedrooms, bathrooms, kitchens, cabinets, and even exteriors. This kitchen is probably one of my favorites. I’m a big fan of high contrast, and this one hits the mark. 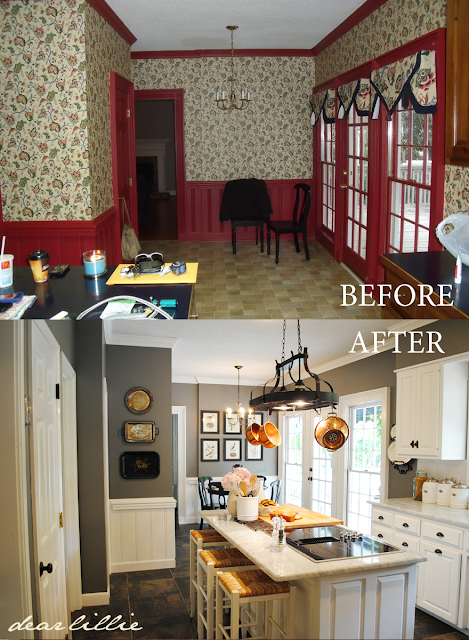 This kitchen that was featured at Dear Lillie, blew my mind. What a transformation! 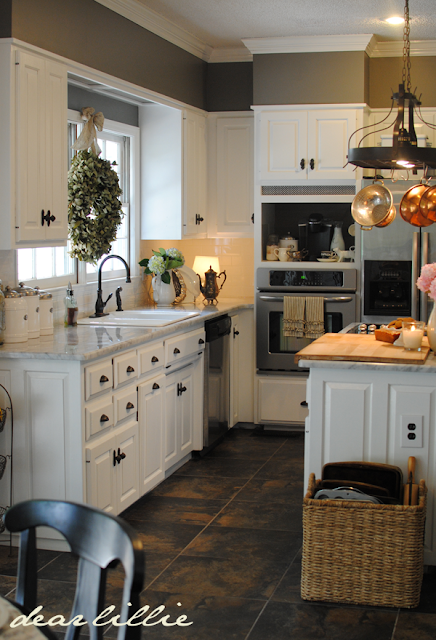 This kitchen went from dated country to completely classic. And yes, that’s Chelsea Gray on the walls. How about a nice cozy master bedroom? 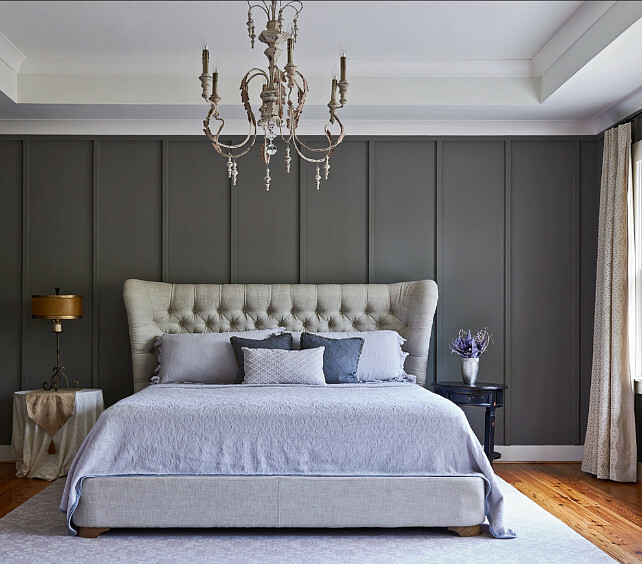 The headboard alone has my attention, but the addition of the Chelsea Gray takes it to the next level. 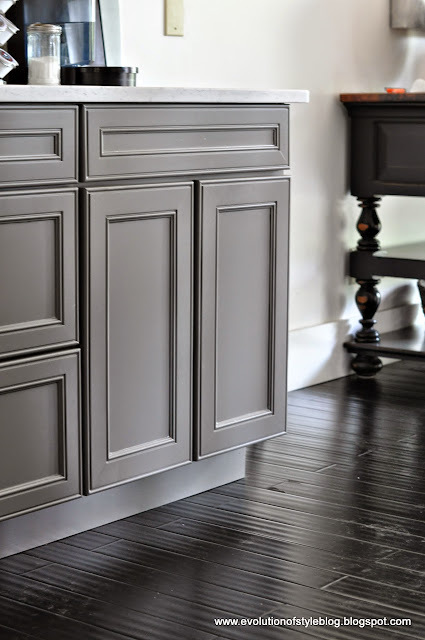 Being a cabinet painter myself, I love seeing Chelsea Gray on cabinetry. It pairs beautifully with brass, doesn’t it? It works beautifully in this kitchen office space. Again, with the brass. And if it works on cabinetry, you know it will work on furniture. 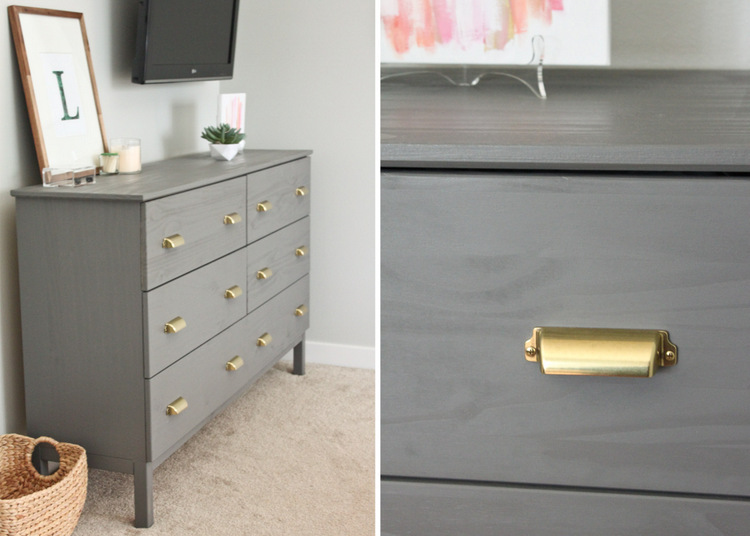 Looks like Chelsea Gray and brass pulls go hand in hand, doesn’t it? 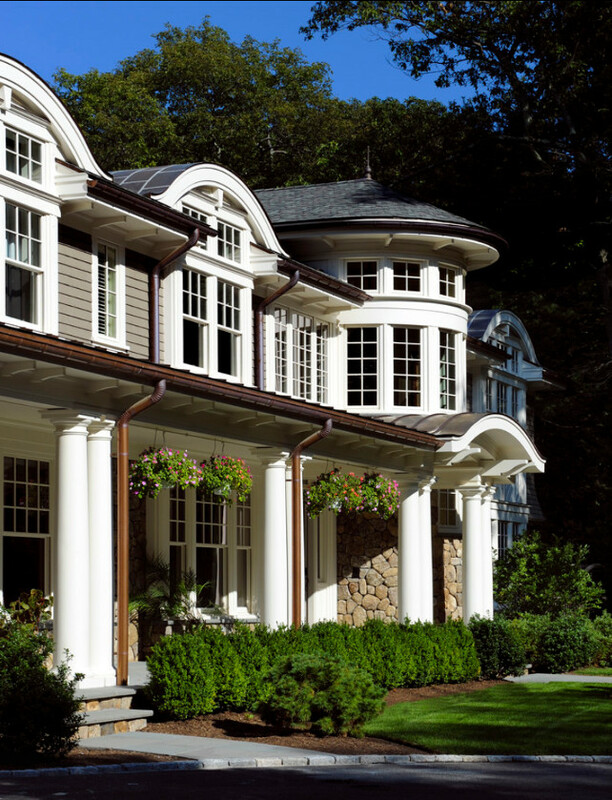 How about Chelsea Gray as an exterior color? 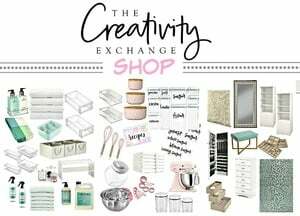 Come on over and check out my blog, where you can get even more color inspiration! 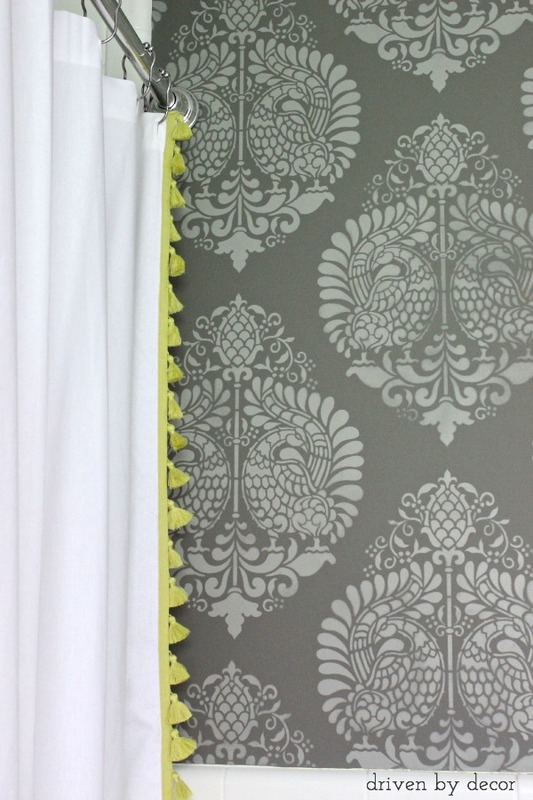 A reader favorite – Color Case Study – Shades of Gray. Traditional Home Office by Redondo Beach General Contractors LuAnn Development, Inc.
How about a two toned gray client kitchen makeover? Thanks for having me, Cyndy! You know how much I love color! Stop by and pay me a visit! 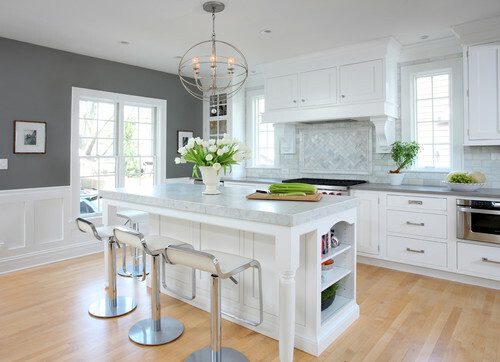 I am thinking of painting my cabinets Chelsea Gray and adding Simply White islands and doing Simply White trim and doors. What would be a good wall color to use in the kitchen area, ajacent great room and hallways? I am thinking of painting my cabinets Chelsea Gray and adding Simply White islands and doing Simply White trim and doors. What would be a good wall color to use in the kitchen area, adjacent great room and hallways? Thinking of painting my powder room Chelsea Gray. I was considering Hale Navy because I wanted something dark and dramatic, but we don’t have blue on the main level and I just wasn’t sure. I thought maybe Kendall Charcoal, but it ended up having an olive green, muddy tone when I put the sample on the wall so that’s out. I’m hoping Chelsea Gray is THE one so I can stop buying paint samples. lol We just painted the kitchen, family room Revere Pewter, the sun room Linen White. The foyer, where the powder room is, was painted a gold/yellow color many years ago. That will eventually get redone once I can convince my hubby to repaint it. 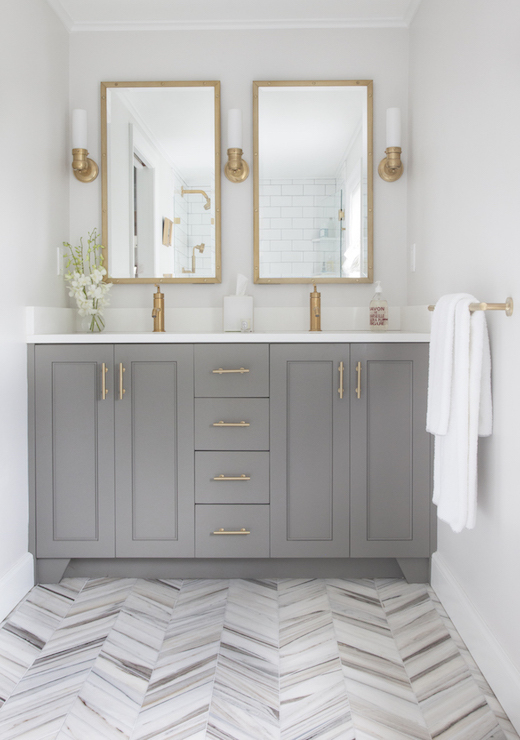 What is wall color chosen in the powder room photo that cabinets are Chelsea gray? It’s stunning! 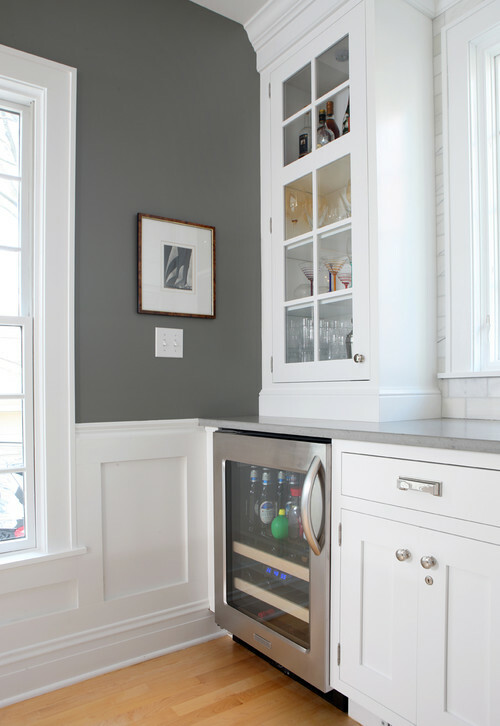 What type of Benjamin Moore cabinet paint do you recommend using for a bathroom? I like the color; however, do you have a specific type of BM paint and primer for cabinets that you recommend?